Iceland have done themselves a disservice with this bag design. 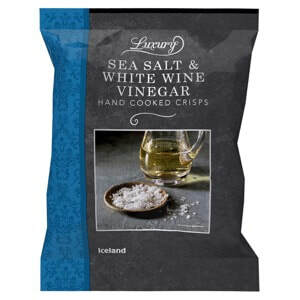 Their Luxury Crisps range are far better than the bland, generic and supermarket own brand style of bag they have provided. The flavour is written at the top, there is a square picture of the flavour in the centre and this is presented on a black background with a narrow flavour colour coded strip on the left. Unlike many Regular Crisps this did not mush up, neither did they crack, snap and crack like many oil hardened Hand Cooked Crisps. Instead they broke down at an even pace with mulch the end result. These were spectacularly characterful for what is ordinarily a very light and pale variety. While they were still a muted yellow colour, there were oil bubbles aplenty and the Hand Cooked nature led to lots of curls, bends and even folded examples. These Crisps were a little misleading. If they were simply labelled as Salt & Vinegar or even Malt Vinegar, they would have scored top marks, but for some reason they have used the words “White Wine” to describe the Vinegar. So, while they were among the best UK own brand Crisps we have taste tested they were probably a little mislabelled by trying to be clever with the flavour descriptions.